2011 Medal of Honor Commemorative Uncirculated $5 Gold Coin | The|Coinologist. The Medal of Honor is the highest award for valor in action against an enemy force that can be bestowed upon an individual serving in the U.S. Armed Forces. 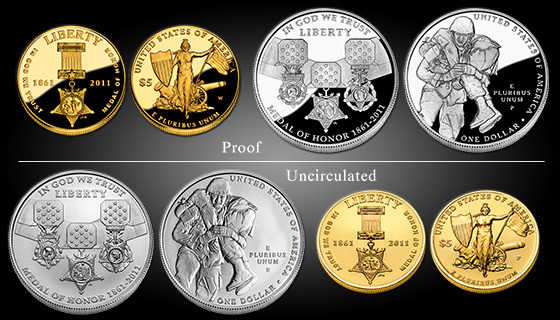 Through Public Law the United States Mint has minted and will begin accepting orders for the 2011 Medal of Honor Commemorative Uncirculated $5 Gold Coin on February 25, at noon Eastern Time (ET). The introductory sales period ends on March 28, 2011, at 5:00 p.m. ET, when regular pricing takes effect. There have been fewer than 3500 of these medals ever awarded since its inception in 1861. This is a beautiful coin and would be a treasured addition to anyone’s collection. If this coin has caught your attention, visit the U.S. Mint and read more about this amazing coin that honors our highest military decoration!